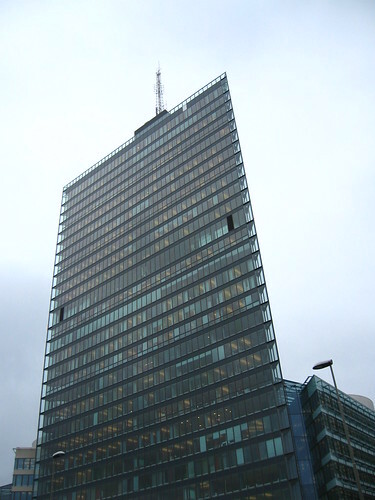 Parasitic Video Network was installed in The Electrum House, an office building located in Kista, a suburb in the most northern district in Stockholm. The suburb contains a large concentration of around 2,000 ICT (Information and Communications Technology) companies and known as one of the worlds most important ICT-clusters, or ‘Sweden’s Silicon Valley. Parasitic Video Network was developed during an artist-in-residency at The Interactive Institute, a media lab housed within The Electrum House. The location was therefore used as a site for development and testing of the video installation. 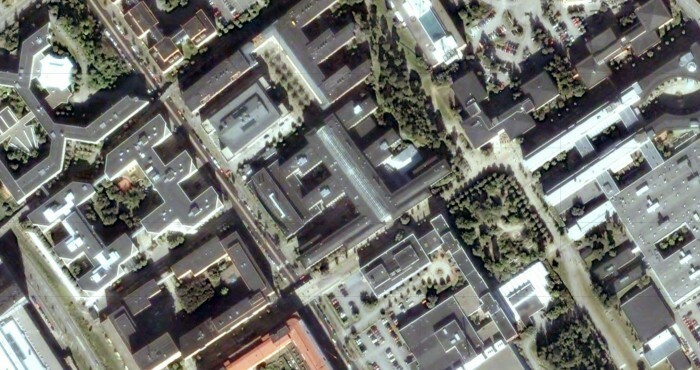 Kista was built around a former military training site, starting in the 1960s, using the ABC, or Arbete (work) Bostad (housing) and Center, urban planning model, a strategy used in other surburban areas at that time. ABC building combined industry and living areas to form self-sufficient suburban zones that were still directly connected to the city centre through public transit. In practice this meant physically dividing Kista into a work and residential area on each side of underground railway tracks with a large shopping mall, or Kista Galleria, functioning as a social space and meeting point, placed in between. Kista’s transition towards an IT city began in 1975 when three large companies, Ericsson, Rifa and IBM, moved there. With the establishment by Ericsson of their headquarters in Kista, other companies followed suit. The first wave of growth happened in the mid to late 1980s during which corporations like IBM, Sun, Oracle, Intel, Nokia, Motorola, Nortel, moved in. In response to a massive migration of IT companies to the area, the municipality altered its zoning regulations by limiting access to electronically oriented businesses. A slowdown in growth following the ‘dotcom bubble burst’ of 2000 was followed by signs of recovery and stability. IT industry continues to influence future urban planning within the area. 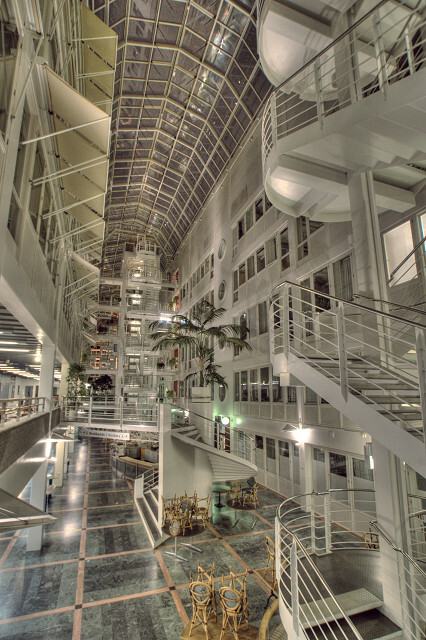 In 2000 the business area was re-branded as ‘Kista Science City’, a living science city, which aims to define itself as one of the world’s leading ICT clusters and model for a network society. Rhetoric found within the promotional brochures focusses on utopic narratives, where progress is brought about by technological innovation, themes introduced by Jacques Tati in his seminal film ‘Playtime’. Kista is a divided city, both in the way the city has been planned out and the level of interaction between people that occupy the residential and business zones. Very few of the people that work within the IT companies actually live at Kista. Most of them, around 30,000 and a majority of ethnically Swedish well-educated men, live in other areas around Stockholm and commute to work. In the evening the business area becomes a veritable ghost town. On the other side of the tracks, very few residents in Kista, 40% of the population immigrants, have jobs in the IT sector. One exception is within the service industry where businesses such as lunch places rely on IT employees as customers. 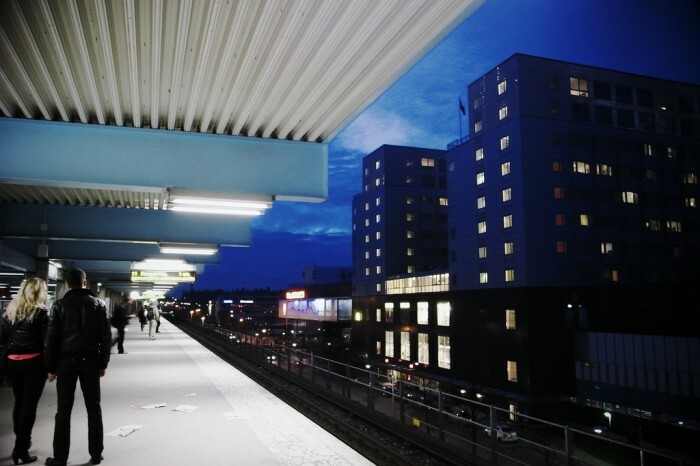 Most living in Kista, also around 30,000, either work in town or depend on social subsidies. Although one of the visions for Kista Science City is to promote growth and diversity in the area by providing opportunities for work and personal development for residents in the area, the actual process is slow and uncertain. One report, in discussing how to bring these two areas into a more united ABC town, actually suggested that the influx of new residents through gentrification and relocation of the existing citizens might resolve this problem. 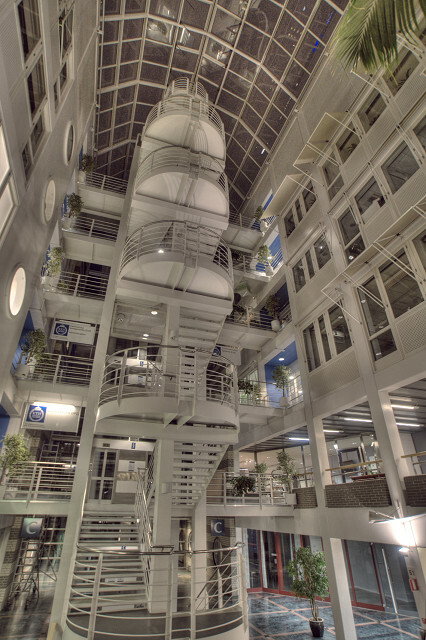 The Electrum House, opened in 1988, is a 6 story building which houses several research institutes, including the Interactive Institute, as well as the engineering, electronics departments of the technical university. It was developed using the triple helix model in innovations thinking, a synergic model between municipality, education and business that encourages proximity of industry to local universities in order to connect newly graduated skilled workers with industry, and promotes entrepreneurship and marketability of university research projects. The building itself embodies architectural aspects of modernism. Glass walls and façades and large, open public areas encourage the flow of air, light, physical movement and little separation between the interior and exterior. In a building where research outcomes take the form of patents and industry products, outcomes based on privacy and non-divulgence of information, architecturally it is Panoptically conceived and designed. Although there are doors with codes to prevent easy passage into the offices, visually there little separation from public and private spaces. The offices are accessed using three of the elevators and stairways located at the two entrances and middle of the building. This offers many different vantage points for how both building and body can be monitored. To understand how to set up the video network, I first did an image study of The Electrum House, where I documented the thresholds between public and private spaces, ways of moving and being seen throughout the building as well as details of objects that filled the environment. This was followed an exploration of an office building in ‘Second Life’ that had ‘visited’ prior to arriving to Sweden. When I arrived at The Electrum House, I was immediately struck by the similarity in look and makeup of the building with this virtual building in Second Life. I returned to Second Life and photographed my avatar from different positions in relation to the building’s architecture. 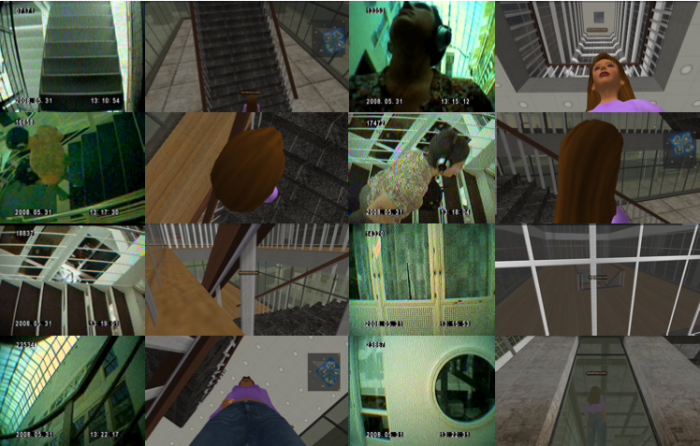 The Parasitic Video Network, installed throughout the Electrum House made a link between these two architectural spaces. Comments closed — Trackback URI RSS 2.0 feed for these comments This entry (permalink) was posted on Monday, March 9, 2009, at 3:10 am by admin. Filed in Installation, Performance.